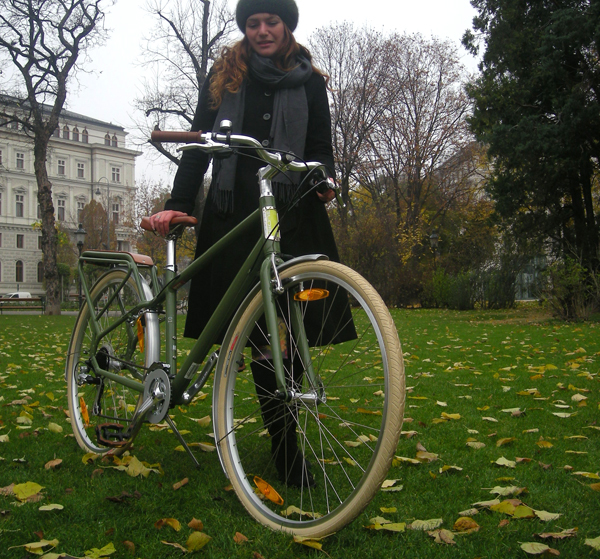 This is the Specialized Globe Haul II that I rode in Vienna while Anna tested out the Retrovelo. 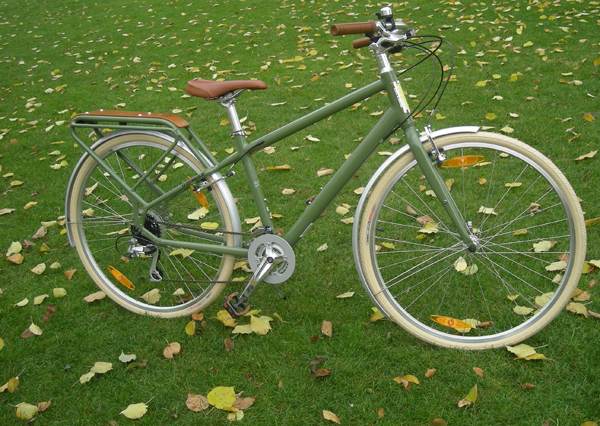 I chose it because it was one of the most interesting other bikes in the shop, because it fit me, and because I liked the colour scheme: the olive drab frame, cream tires and brown accessories look quite nice together. As you can see, it is mixte-esque in construction and has derailleur gearing (the Shimano Alivio group; 3 in the front and 8 in the rear). The frame is aluminum. I did not get a clear photo of the gear shifters, but they are plastic indexed thumb shifters (located on the handlebars); not sure of the manufacturer. Cane Creek headset. Some of the cables are internally routed, which is a nice touch. 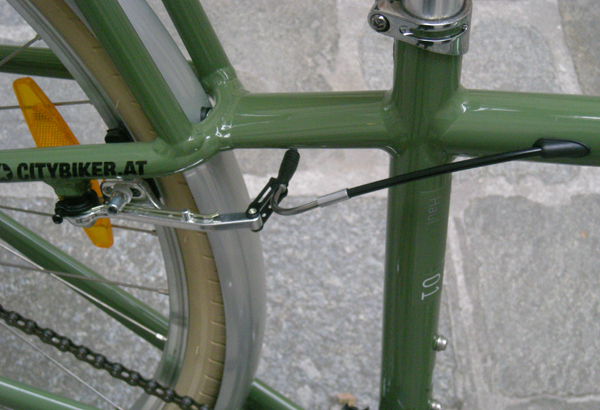 Rear brake; internal cable routing. As you can see, the seat cluster is unusual; I am not even certain the term "seat cluster" applies here? The top tube sort of flows past the seat tube and diverges into the rear stays. As the name of this bicycle suggests, its main purpose is to haul things. Therefore its most noticeable feature is the elaborate wood-topped rack that is built into the frame itself. The rack is rated for a 50kg (112lb) load. Here is a better look at how the rack is integrated into the frame. The idea is pretty neat and from a distance it looks nice. But those welding marks really don't do it for me - which should come as no surprise to those familiar with my tastes. I understand that this is a matter of personal choice though, and that some people like them. Straigh unicrown fork; 700C wheels; fenders; caliper brakes. The tires are cream Specialized Nimbus 700C x 35mm. They felt great until we had to ride on a stretch of the road that was all cobblestones. That felt aweful - but I am not certain whether to blame the tires alone, or whether the aluminum frame also plays a role. I am curious what the experts think. Front view. The handlebars are swept back, North Road style. 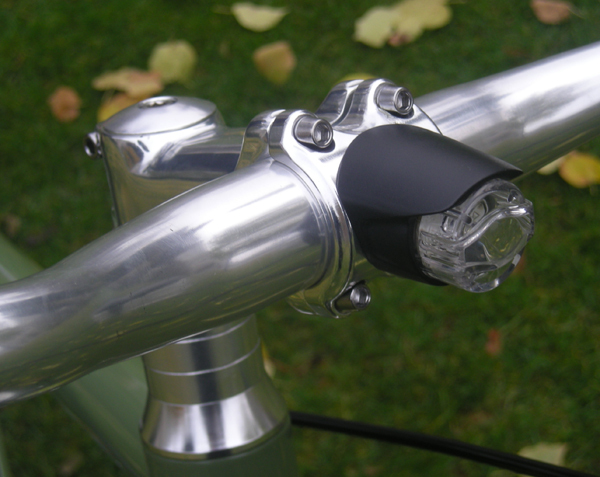 There is a small bell, and an LED light is cleverly integrated into the handlebar setup. Close-up of the headlight. A neat, utilitarian look that is in keeping with the rest of the bike's design, I think. 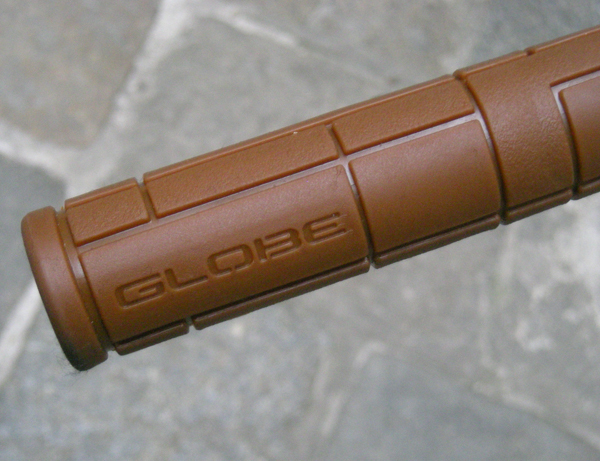 Globe brown rubber grips, which match the Specialized brown pleather saddle. I did not get a close-up of the saddle, but what surprised me about it is that it is pretty narrow for an upright bike and is more like a roadbike saddle. 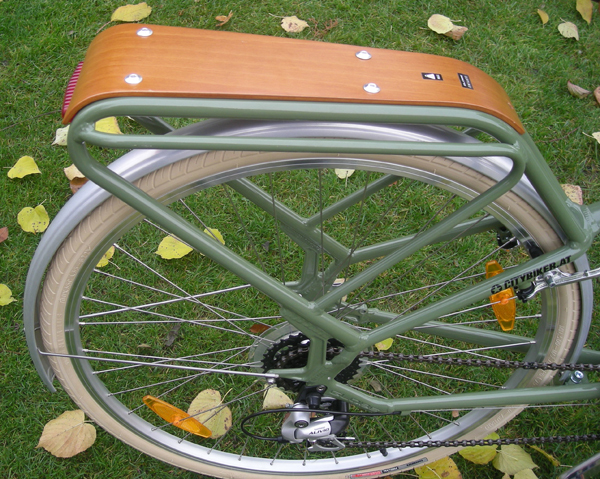 Here is another shot of the rear rack, whichI think is the Haul's coolest feature. LED tail light. I rode the Haul around Vienna for close to 2 hours, and you can find loads of photos of us in motion here and here. Overall it is a comfortable and user-friendly bicycle: stable, easy to operate, light to carry, fast on hills, fast to accelerate, great braking power, and maneuverable. I also think that the design is quite harmonious: well proportioned, good lines, pleasing to the eye, and nicely colour-coordinated. As I mentioned earlier, the only problem for me was the cobblestones: My teeth were chattering and I considered walking the bike at several points. This would be an issue if your city has cobblestones - so take that into consideration. Personally, I am not attracted to welded aluminum bicycles - but that is a matter of taste. As far as mass-produced bicycles go, the Globe Haul seems like a good, interestingly designed bike. nice review! it's good to know that bike manufacturers are finally designing bikes from the ground up to blend classic style with utilitarian function. for a mass-produced bike, they did a great job with the color scheme, the choice of 700c wheels with northroad bars and integrated lighting, and the overall appearance of the bike. (as a side note, the color is not too different from RAL6021, the color i almost chose for powdercoating my touring frame!). i'm guessing from the alivio group that the bike is targeted somewhere in the lower-mid priced range. but at that price-point, it's also expected to see those ugly welds!! i agree, they detract, but the average consumer won't mind. I think its just the cobblestones. I rode a steel bicycle (no suspension) over some once and it was horrible. the lights - are they battery or generator operated? Very informative review, as always! I looked at the Haul online briefly when pondering how to replace my wrecked Specialized. 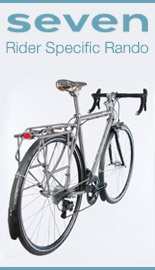 I was attracted to its design (although I share your views on aluminum and welds) and particularly the integrated rack. The fact is, though, the only thing I haul on my bike is me, plus maybe a jacket and occasional book or loaf. So, the capacity is overkill for me -- and most cycling Americans, I suspect. Still, it is a good-looking bike with those cream tires. Thanks for taking time on your trip to keep us informed and enjoying your rides! $660. However, I don't think I'll ever get an aluminum bike. A good and honest review! I like mixtes and really appreciate the design elements of this one, especially the integrated rear carrier which flows so organically from the main frame. 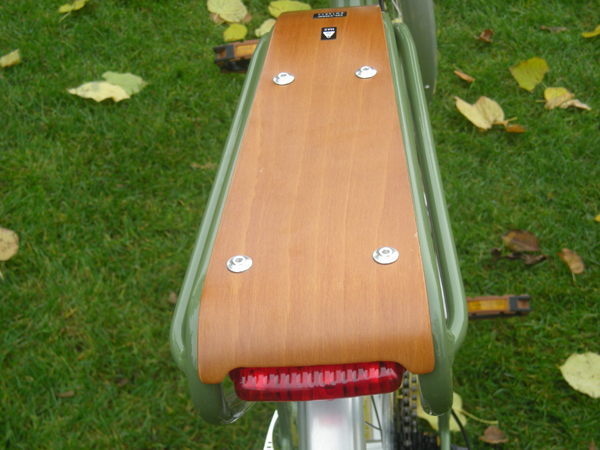 The colour is great, the little headlight very neat, the wooden carrier base a delight. A shame that it's welded rather than lugged though! I agree with you there. Maybe producing it as a lugged bicycle rather than welded might push the price point too high. Do you know where the bike is made? Europe or Asia? It wasn't clear on the Globe website. The welds associated with the rack looked much less smooth than the ones in the main triangle in the photos. Might two different fab shops be involved? My Specialized Tricross has much more attractive welds. Also, while that new wood platform looks really sharp, would it hold up to rain, heat, cold and UV? I don't know about any of the techno mumbo-jumbo, but I like her design. She's a snappy looking ride and outweighs any sad mountain bike folks in the US (including previously me) ride all over the place. Yay for good design effort! Cobblestones are awful on anything without suspension IMHO. There's a short stretch of faux cobblestones on one of my routes and it is nasty, nasty, nasty on the fully rigid bike. Even the hardtail MTB with its plush front forks is pretty chattery on the cobblestones. Regarding the welds, aluminum welds almost always look a little coarse - it's the nature of the beast. 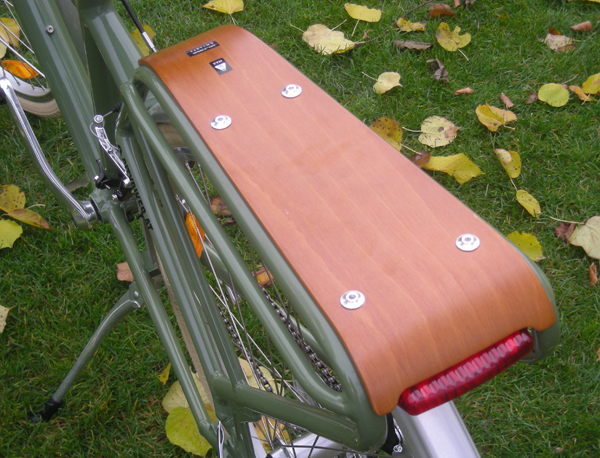 The wood on the rack is a nice touch plus it also looks like you could hang some panniers of it should you want to. Re the cobblestones: The Retrovelo Anna rode felt just fine on these same cobblestones, and both my Pashley and my vintage Raleigh DL-1 do fine on the ones at home - so it can't be just a matter of suspension vs no suspension. Anna's current mountain bike has wide tires and suspension, but she said the Retrovelo did better on the stones. somervillain - They did do a good job with the aesthetics and I agree that many will like this bicycle. Personally, I would take the $660 and use it to go all out refurbishing a vintage bike, but I think this would be too much of a bother for most consumers. Anon - The lights are battery operated. Mike - This bike actually looks better in person than the official online photos, especially the whole rack area and its intricacy. Carinthia - To make it lugged they would need to first make it out of steel, which would change it entirely and increase the weight quite a bit. For a utilitarian bicycle like this, welding can look quite appropriate - a la A.N.T. - but of course that's on an entirely different level of bikedom. I assume that like 99.9% of today's mass produced bikes, the Globe is made in the Far East. Tires and tire pressure are the most likely culprits with respect to the ride over cobbles. Many times people inflate tires to the max pressure listed on the sidewall hoping to decrease rolling resistance. On rough surfaces the bike jolts up and down rather than the tires conforming to the roughness. For a light rider 50 psi (3.4 bar) may be plenty. 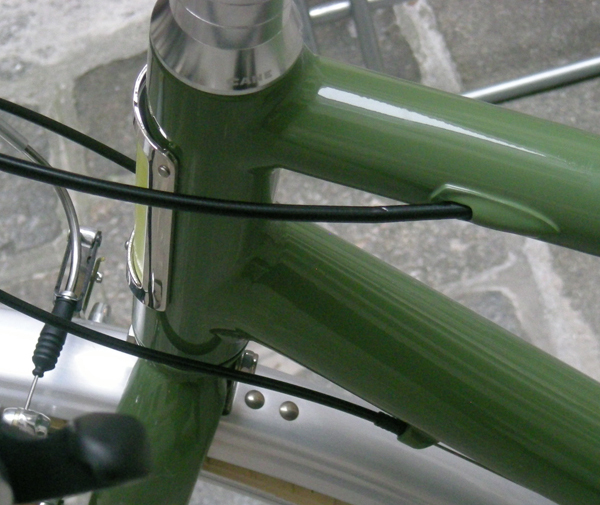 A secondary contribution comes from the straight forks and the extra bracing provided by the rear rack. 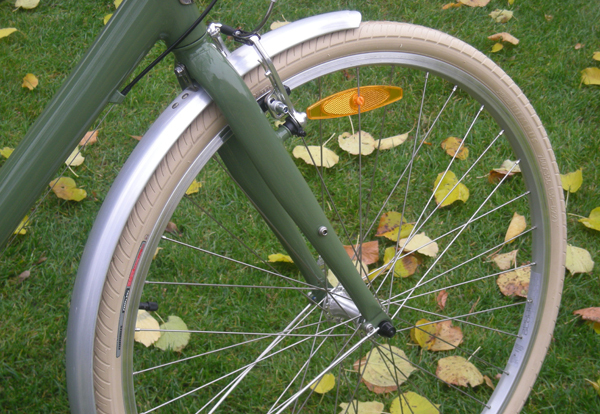 Longer, curved forks are more forgiving over rough surfaces. 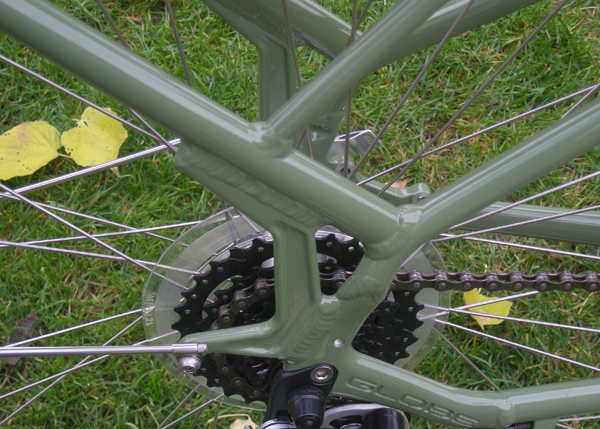 The rear triangle has been doubled, which will reduce it's ability to deflect when going over bumps. We have been convinced that stiffness is a virtue in bicycles, while a little flexibility may be a very good thing. anna - I see what you mean about the headlight, though I think it is fitting with the rest of the bicycle. Steve - I considered that. The photos make the welds of the main part of the frame look cleaner than they are in reality, but there is still a categorical difference between them and the rack welds. Sigrid - I too will be much happier seeing this on the streets than some of the monstrosities out there! Mike J - Thanks; I overlooked the straight fork as a possible factor. I haven't tested this bike but I like what I see. The Specialized Globe Live2 with the front rack is another favorite and a wonderful shade of dark brown. I'm dying to test. I love te swept back handlebars but agree with you about welding marks. I am a bit put off by them. They are on my Specialized Expedition and I've had to learn to ignore them. I'm not making this up: I thought of you/your blog when I saw the welds on my Live 2 Mixte. "Toothpastey" was the word that came to mind and I know I got that from you! However, the dark brown color of the bike obscures those areas pretty well and I think that the big porteur rack draws the eye. I haven't ridden on any cobblestone surfaces, but I have been over some gravel and I didn't enjoy it. I couldn't help but think of the manual's cautionary tone as it described the types of riding that the Live 2 Mixte is not designed for and feeling a little vulnerable. Still, I made it over the gravel patch just fine and Betty (my bike's name) has been a monster on hills. I'm coming to appreciate the perks of technological advancements! I do feel like I'm sitting in on a grad class - just enjoying soaking up the education. Thanks for the review and all the intelligent commentary. Mike is right about tire pressure and the straight fork. However, I think the aluminum frame also contributes to the rough ride on cobblestones. Aluminum frames are usually made of wider-diameter tubing than steel frames are. Wider tubes makes for a stiffer ride, which some people like. But those oversized aluminum tubes also make for a less forgiving ride. Several books I've read have alluded to what I've just said, and for me it's confirmed by my experience of riding several and having owned three aluminum bikes in my time. It's one of the reasons why all of the bikes I now own are steel. That's a real good looking bike. I'm happy that so many big companies are making serious commuting bikes, bonus points when they make them look this classy. Thanks for the review. Justine - I too have read that argument about aluminum, which is what I was initially alluding to. However, I know that not everyone agrees - including Sheldon Brown. It is an interesting debate. I have a dutch bicycle, it's those ancient design lugged one, black with huge rear rack, coaster, big handlebar etc. you know the kind. 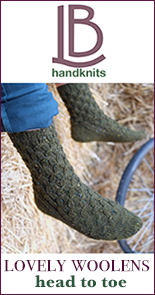 I love it to death, wonderfully comfortable and feel very civilised, the problem I found with it is that it's very heavy (only when you really want to cane it), and it's very flexible. the flexing is the worse thing, when I have heavy load on the dutch, the bike shimmer badly, as well as even without load, going more than 12mph cause the frame to shimmer. That's perhaps why the Globe Haul is alu, to keep the weight down and stiff enough to prevent the bicycle from shimmering with too much weight on the rack. the harsh ride of the globe is a compromise I wouldn't mind. In the case of this hauler the frame designers balance strength vs. light weight vs. comfort. If you want to go fast pump up the tires. If you want a cush one you want to deflate and go w/the maximum volume tire that will fit. Folks don't play with tire pressure enough--it's fun and it's a cheap way to give your bike different personalities. i just found this post while searching for reviews of the globe series and wondered if you had an opinion as to how well this might pull a trailer with two kids. vintage (or vintage-inpired) step-throughs are my favorites, but with two small children i need a bike that will tow them well. i haven't been able to ride one as there isn't one in town, so if you have an opinion as to how you think this might do while towing a trailer i'd love to hear it. thanks! Do you know what kind of pannier bags can go on that integrated rack but i cant fit mine on there or find any pictures or references as to what bag is supposed to go on there. 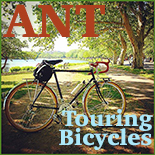 I got back into bicycling on a Giant Transend which has the bent wood rack as well. Its beautiful and probably the one part of the bike that sold me on buying it. Sadly, its quite slippery so things have a tendency to slide off the rack. I've had to add skateboard grip tape to keep things from falling off so easily which ruins the look a bit. 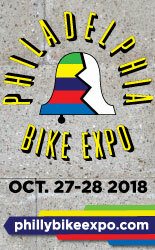 I just got back into cycling after a 25 year hiatus. Once I got a car, the bicycle fell by the wayside. I purchased this bike because in a shop of 300 other bikes, it spoke to me. I'm very happy with my purchase and look forward to using my bike for enjoyment, and the utility it has built in to it. I really like my Globe bike, except for the rear spokes. I've had it since February, and three spokes on the rear wheel have popped. The retailer (Richardson Bike Shop) fixed two spokes under warranty, and charged me $25 for the 3rd one. Other than that, I really like this bike. It's light, it's comfortable, and a pleasure to ride. I suppose I'll just have to get an aftermarket rear wheel . . .
Reduce tire pressure, the correct pressure depends on the load they are carrying. Those tires are going to be of a high-load type; for a maximum weight rider and with whatever is the cargo carrying capacity of the bike. If you are riding without cargo and you don't weigh around 300+ lbs, it will naturally ride like it's got wood tires and no flex in the frame. It was built to haul a substantial load. Drop the pressure when riding it "empty", and it will ride much better. A frame can't be too stiff, unless one likes to have some of their peddle effort used by a flexible frame to express that flexibility. Tires. Tire pressure. Good grips and a good saddle. Proper fit.